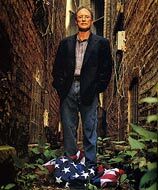 There is a huge blogswarm going on about this photo, from Chicago Magazine, of Obama's unrepentant terrorist associate, Bill Ayers stomping on the American flag. The photo was taken in 2001, the same time Barack Obama served on the Woods Fund Board with Ayers. This was also the same time that Ayers donated to Obama's campaign. Marathon Pundit has similar photo, and many political bloggers are saying it long past due for Obama to disown his association with this controversial radical. The question that remains is, will the media pick this up or will they write it off as old news? Its worthy of recycling this to further probe into Obama's judgement, the one thing he says he should be measured by. Photo credit: Jeff Sciortino for Chicago Magazine.